1. DE Map: This widget will display the map in your site's header. - Style: choose the style the widget will appear: vertical or horizontal. - You can also choose to show how posts counts or hide empty categories. 3. DnE list places: This widget will display some places in your site. - Category: select the category to choose places. - Location: select the location to choose places. - Query: choose the way to filter the places. • Featured posts: short by featured places. • Recent posts: short by recent posted places. 4. DnE review: this widget will display reviews from your users. 5. DnE testimonial: this widget will display great words from your users. You can also decide how many posts will appear in this widget. 6. DnE title: this widget is similar to the content block in Visual composer, you can insert a title and drop it in the sidebar you want. 7. DnE social: this widget will display all your social networks information. 10. DnE suggested: you can use this to show some suggested restaurants as referrals for customers. 11. DnE text footer: the name speaks for itself, you can write anything you want and use this widget to display in the front-end. 1. 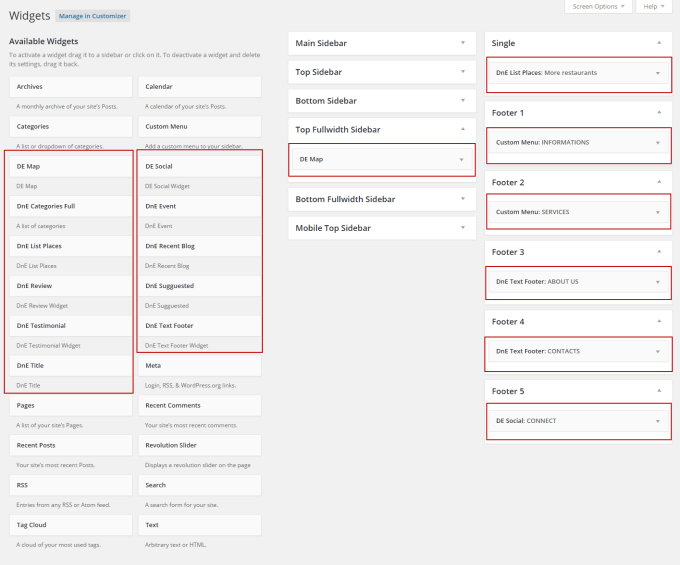 Main sidebar: This sidebar is located on the left side of the category pages and blog page. As you can see in our demo site, we’ve added “DE Review” widget to this sidebar. 2. Top sidebar: This sidebar is located on the top of category pages. We’ve chosen “DE list places’ widget to add in this sidebar. 3. Single: This sidebar is located on the left side of the single pages. “DE list places” is also the widget we added in this sidebar. 4. Bottom sidebar: This sidebar is located on the bottom of every category pages. You can choose whatever widget you want to add to this sidebar, you can also leave them blank as your demo site. - “Text: About DirectoryEngine” in Footer 1. - “Meta: Link” in Footer 2. - “Text: Contact us” in Footer 3. - “DE list places” in Footer 4. Don’t forget to click “ Save” button to keep all your settings.